Beads. It’s like my craft “room” is taken over by them. Here are eighteen FUN things to make with beads that are NOT jewelry. 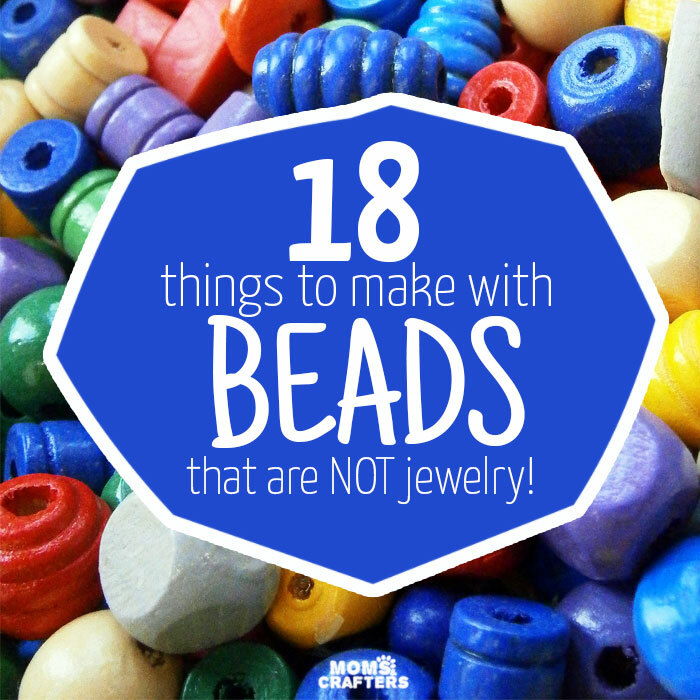 I make bead crafts all the time because I have so much surplus from my jewelry making projects and these are just some ideas that AREN’T jewelry! If you’ve ever been an aspiring jeweler, you’ll know just how quickly the beads can take over. They come in such an awesome variety, that you simply can’t help stocking up on every. single. type of bead. Over time, I’ve made things with beads that are NOT jewelry. 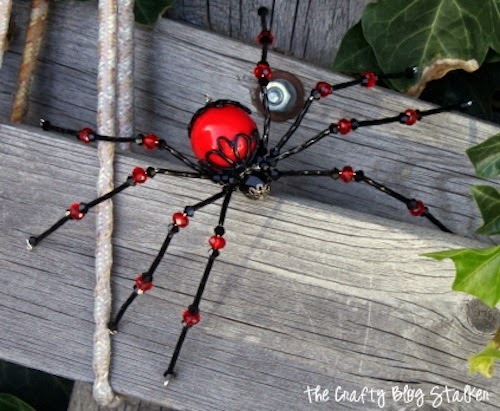 I gathered some other things to make with beads from various bloggers, and the result is this amazing collection. It just proves that beads should be a staple in every craft closet – not just those who make jewelry. You will notice a pattern. Most of these things to make with beads use a few specific types of beads: pony beads, Perler beads, and wooden beads in various shapes, colors, and sizes. That’s probably because they are the most frugal for crafting, but they can also be the most versatile. Try substituting some out for glass or other beads. Regardless, the three types of beads I mentioned above should DEFINITELY be found in every craft closet, for their versatility, and the endless options they lend to crafting. 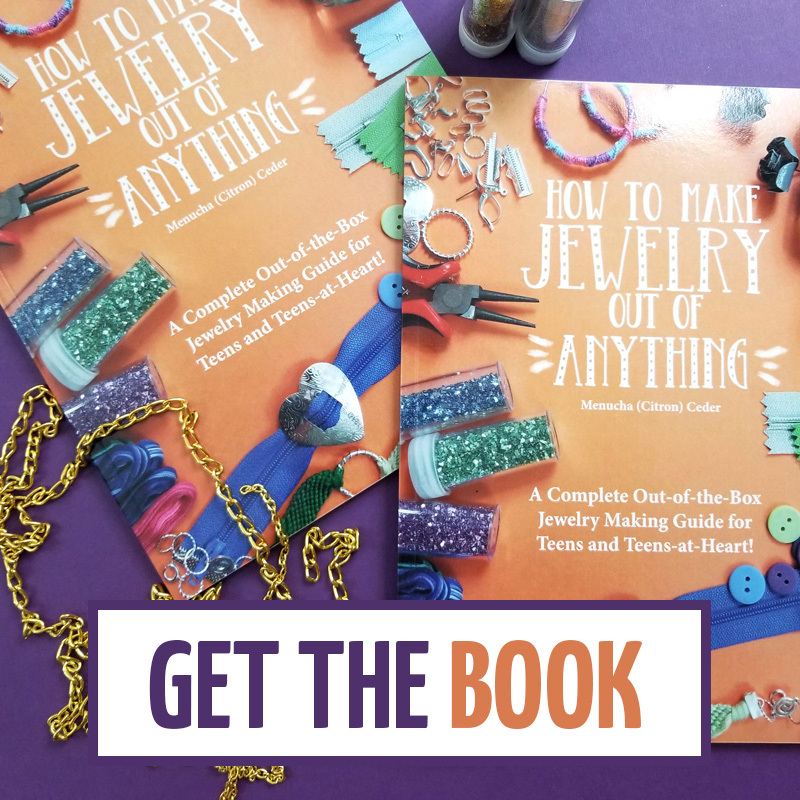 Want to learn how to make jewelry? Get the book! 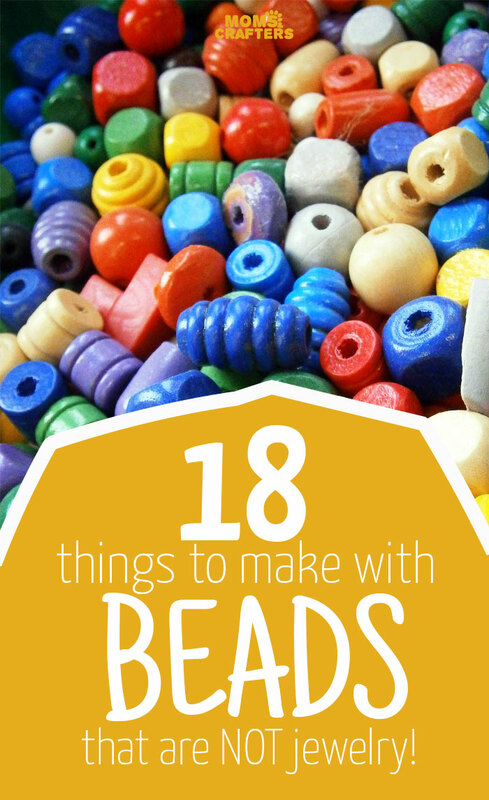 18 THINGS TO MAKE WITH BEADS – THAT AREN’T JEWELRY! 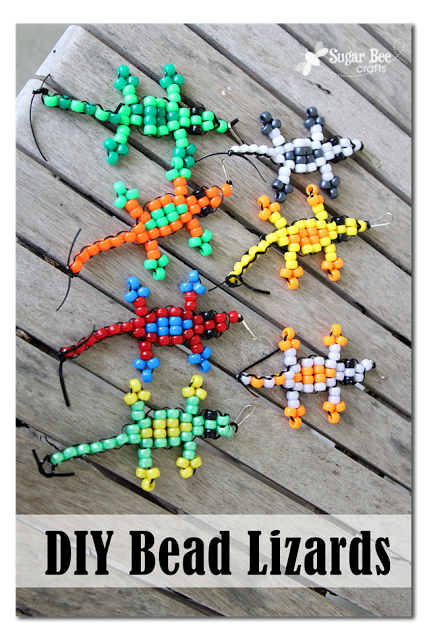 These friendly pony Bead Lizards by Sugar Bee Crafts are a perfect summer camp craft! Or, make them in the winter to look forward to warmer weather. 2. Tetris inspired magnets are easier to make than you think! And they look so great on your fridge, locker, or given as a gift. 3. 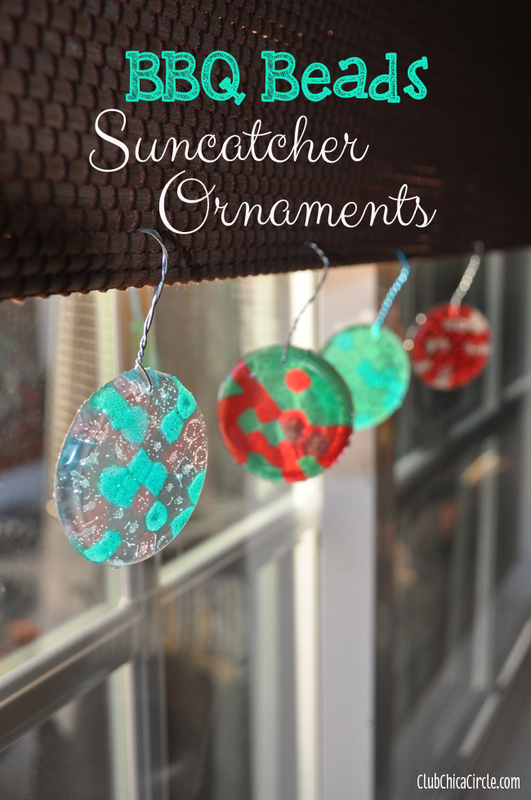 These BBQ Beads Suncatcher Ornaments by Club Chica Circle are magnificent for any time of year! Use them to reflect the summer sun, or to capture a little winter brightness. 4. Bead sculptures by Artterro make for an open-ended craft for any age. When you’re done, hang it on a ribbon, or display it on a desktop with pride. I made this with my brothers and nieces using the kit, and they had hours of fun with it! 5. 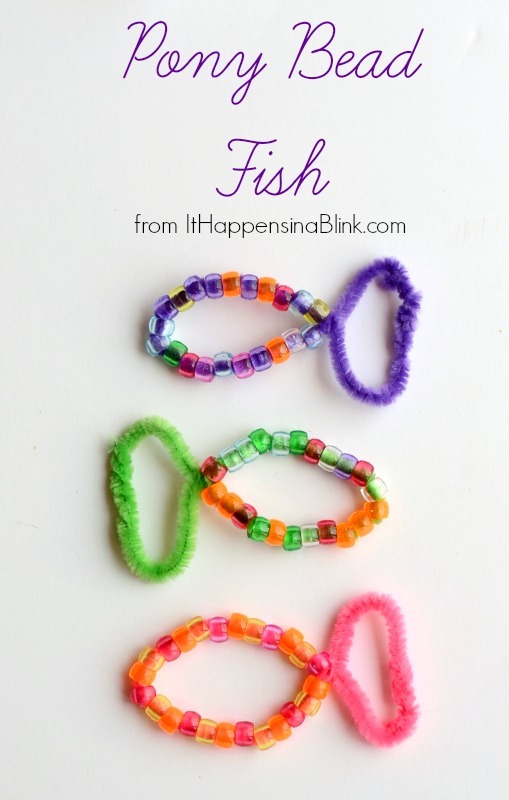 Pony Bead Fish by It Happens in a Blink are a great way to practice fine motor skill with little ones. 6. 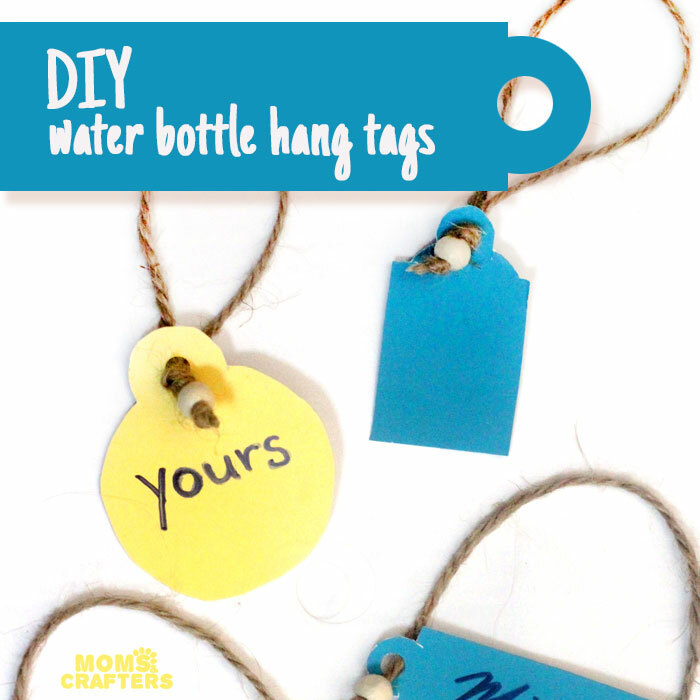 Water Bottle Hang Tags are a perfect way to make sure water bottles don’t get confused – in summer camp, your family picnic, or any other group event. They’re also a fun party craft to make, and the beads here are for form AND function. 7. Hungry Caterpillar Bead and Pipe Cleaner Craft by A Mummy Too is so clever! The youngest in the family can make it to go along with the book. Click on the image for instructions. 9. 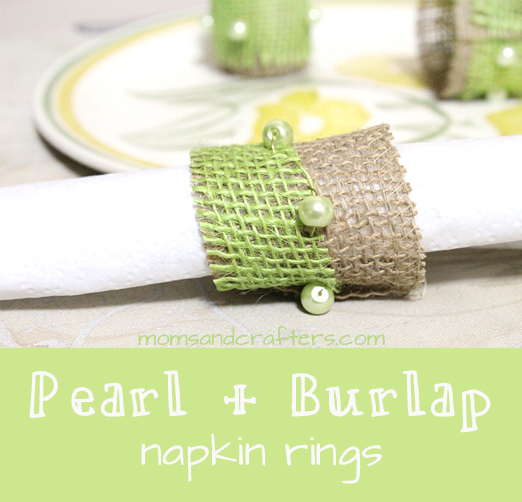 Pearl and burlap napkin rings have a shabby chic look to them that is there thanks to those pearl BEADS! Make them for any occasion, and customize the colors to match your tableware, just like I did. 10. 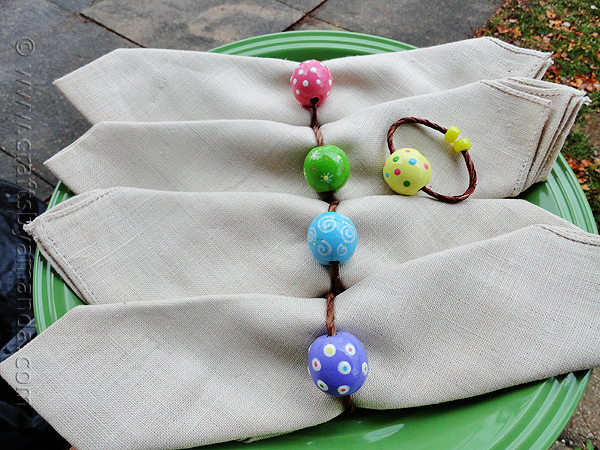 Pretty Spring Napkin Rings by Crafts by Amanda take beaded crafts to a whole new level! Click to see how it’s done! 11. Now THAT’s what I call a functional bead craft! Make these Perler Bead Buttons by Maker Mama to go with your next sewing project. 12. 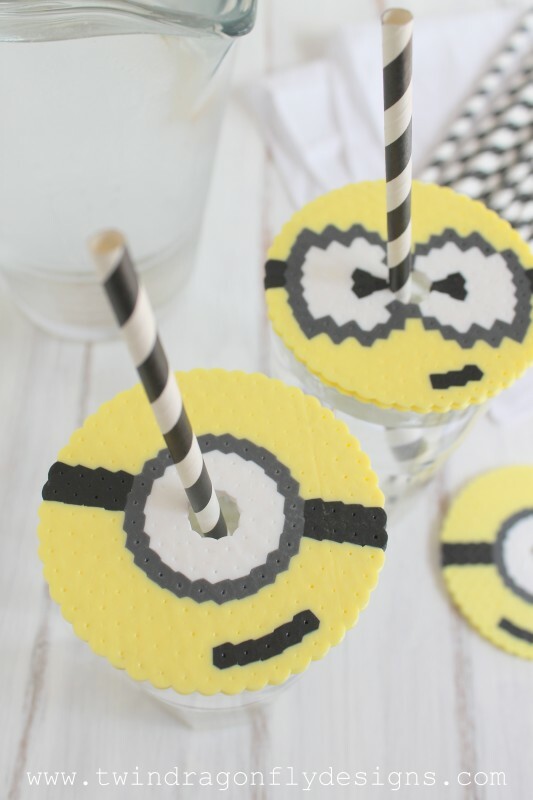 Here’s another functional Perler Bead craft – Perler Bead Minion Cup Cover by Twin Dragonfly Designs! 13. 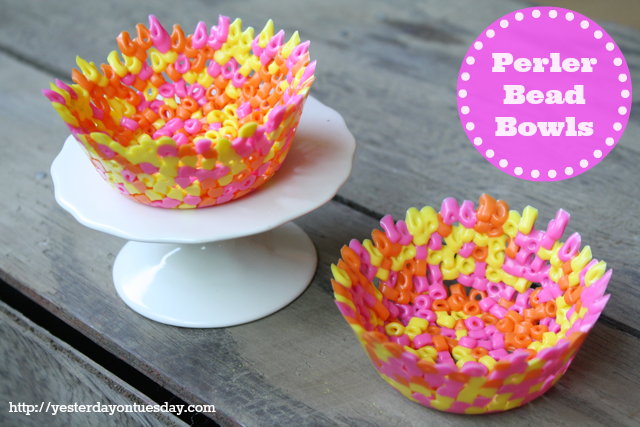 And while we’re on the subject of Perler beads and function: make some DIY Perler Bead Bowls by Yesterday on Tuesday. 14. 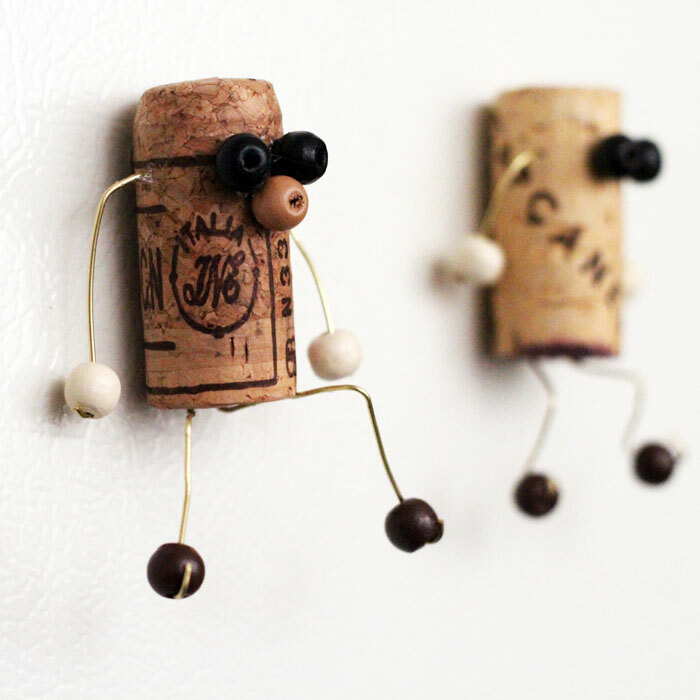 These cork character magnets are simply exploding with personality! You’ll want to make a dozen at least. 16. 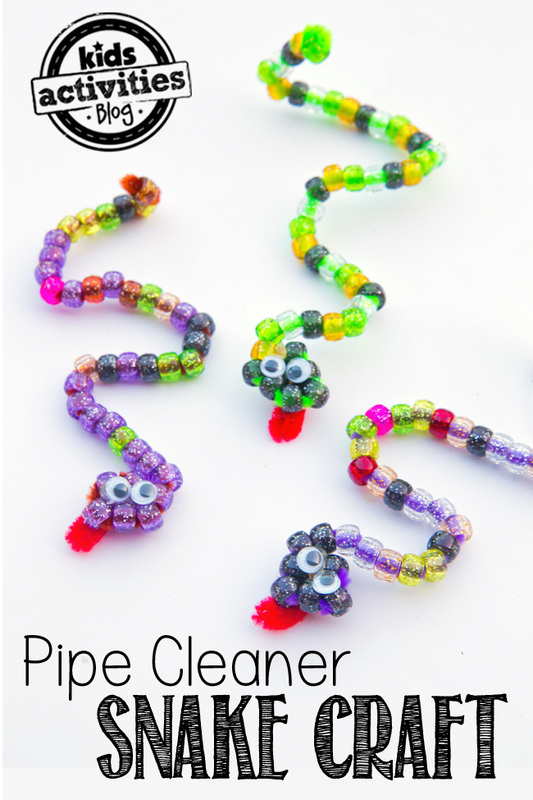 My husband loves snakes, so these beaded snakes by Kids Activities Blog are a favorite of his. Click through to see the clever little twist that forms the head. 17. 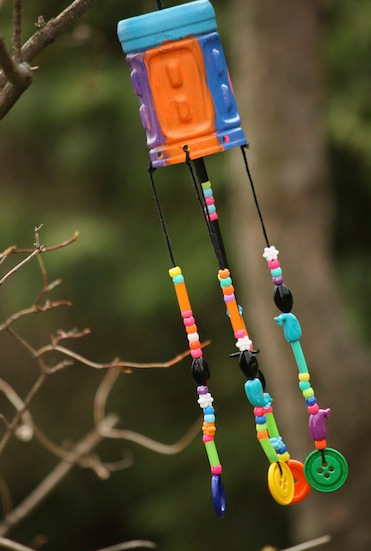 Beaded Wind Chimes by Happy Hooligans are hard to make NOT come out great! I love how she combined it with upcycled materials too. 18. 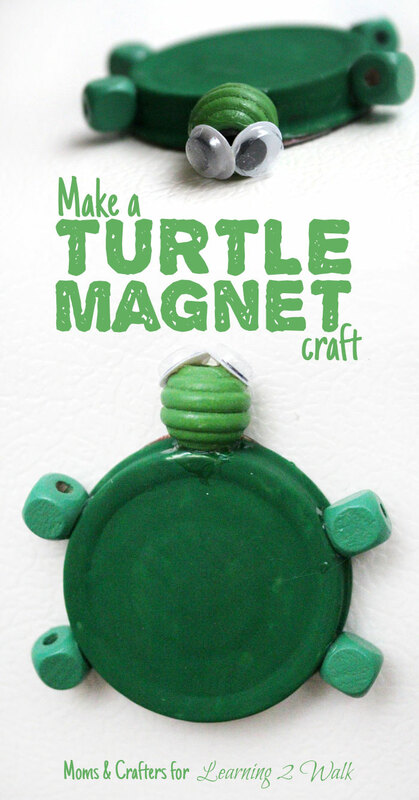 This friendly turtle magnet was originally born for the sake of teaching kindergarteners all about the letter T.
DO YOU HAVE ANY OTHER IDEAS FOR THINGS TO MAKE WITH BEADS? COMMENT BELOW – I’D LOVE TO HEAR! Crafts for kids, Crafts for Teens, Quick and easy crafts. Bookmark. thank you soooooo much for this post, it’s filled with creative yet practical ideas !! Simply wonderful ! Miniature-making (very much a craft du jour- thanks to the Fairy Garden trend’s explosion of popularity in recent years; this has caused demand for miniatures to spike, therefore allowing the astronomical inflation of prices for miniatures by vendors. As someone on a university-student budget, this exclusion-via-disposable-income-levels can be a bit frustrating; I really hope I’m not the only person who refuses to pay more for a 1:12 scale umbrella than it would cost to buy a regular, full-size, 1:1 scale, actually useful, umbrella!) is a craft which requires a little more-than-usual creative thinking in terms of finding materials to use. On the upside, upcyling is a fortunate trend in crafting (for multitudinous reasons), as is repurposing materials, and simply seeing potential craft use beyond an item’s original intended function can be very inspiring, particularly in the case of crafting miniatures. Miniatures are small, colorful, composed of somewhat complex combinations of shapes (of course this varies, case-by-case), and are made from diverse materials. Beads are small, colorful, come in all sorts of shapes- from spheres to seahorses, and all display all sorts of faceting, some of which create very effective trompes d’œil and added depth, while others are carved meticulously, and others still are made from shapes fused together- and are certainly made from diverse materials. 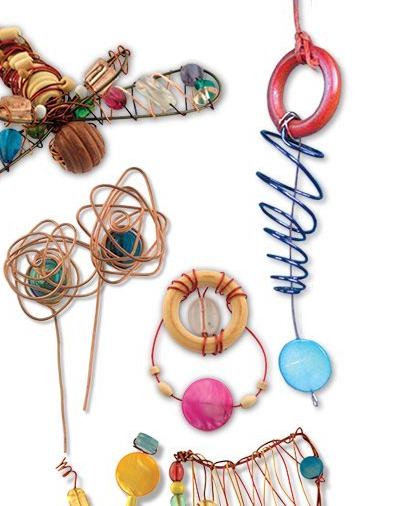 Beads made from various plastics, different types of glass, natural and synthesized crystals, clays ranging from polymer clay to natural Terra cotta from the ground, paper, string/yarn/twine, felt, wool*, porcelain, coconut shells*, yucca*, feathers*, seedpods*, seashells*, fossils, petrified woods and corals a.k.a. Jaspers (fossilized trees/corals which retain their original structure, but all biomatter has been by minerals) , amber (natural, fossilized tree sap), gold**, silver, copper**, platinum, bronze, brass, aluminum, titanium, steel, lead (beware: some people, particularly among the wee ones, have a habit of absentmindedly sucking on necklaces/pendants; in such cases the use of lead must of course be avoided, though it is not particularly common to encounter lead beads), pewter, iron, diamonds**, emeralds, rubies, sapphires**, whole freshwater pearls (often cultured on oyster farms) and saltwater pearls*, agates, quartzes, howlites, marbles, jades, turquoise, serpentines, obsidians, onyx, hematite, opals**, goldstone, sunstone, moonstone, amethyst, aquamarine, peridot, geode slices, citrine, ebony, enamel, flowers*, teeth*, claws*, bone*, antler*, horn*, wire, chainmail, coins, keys, guitar picks, meteorites, leather*, granite, rubber*, cork*, cardboard, uncooked pasta…I could go on and on, but basically, if you can loop a thread through it, punch a hole through it, wire-wrap it, tie it up on a string, enclose it in a finding, weld it together, or clip it on a cord- you’ve got yourself a bead. Due to their versatility and small size, beads can be the perfect materials for crafting miniatures. Wooden beads can be glued to flat surfaces as table or bench legs. Larger beads with flat enough surfaces to not roll around can be used as flower pots, long as the holes in the beads are large enough to stick in miniature flowers. Pretty, small, shiny beads can be glued into miniature mosaic patterns for path edging, miniature frames, or stepping stones. Stacking and gluing metal-colored or matching colored beads on top of slightly larger, matte, translucent beads is a way to create tiny perfume bottles and other mini vanity items. Spherical beads with very small holes can be painted to look like basketballs, soccerballs, goofballs, beachballs, etc. Cubic beads can be glued to the bottom of miniatures which constantly fall over, so they have a flat surface on which to rest. Green seed beads + leaf-shaped (or even grape-shaped and colored!) beads can be strung on wire to create tiny, manipulable ‘vines.’ This time of year, in autumn, round beads can be painted orange; just stick a little tiny silk leaf or clipping from a green pipe cleaner into the hole to make miniature pumpkins! Beads can also be used to decorate minis with ‘picks’ which remain visible once stuck in place, such as miniature Shepard’s crooks, tiny bird houses on picks, etc. Sometimes beads of the proper size and color can be strung onto thread/wire to resemble holiday lights; small, red, round beads, fed onto the branches of faux foliage can turn a miniature shrub into a holly berry bush. Tube beads can look like tumblers if placed in the right and context. Small, faux pearl beads can be placed into a miniature bird’s nest for an adorable finishing touch. Beads can help fill in a miniature fruit bowl with tiny ‘apples’ and ‘oranges.’ Got teeny tiny beads? Make a tiny bead curtain (go for it with your miniature scenes; goodness knows you don’t want that dated fad hanging in the doorways of your actual house lol). Beads can liven up tons of miniatures as accents and embellishments. If you’re far craftier than I, you can even make 3D sculptural miniature flowers with seed beads and wire. Sometimes, a single bead can serve as a miniature all on its own, such as a little glass mushroom bead, a little stone or wooden bead carved in the shape of a turtle, tiny bell beads are still just tiny bells, and charms and pendants can essentially be miniature, 3D items, such as clocks, birds, harps, tiny wall art, lanterns, and much more. Transparent, fillable, metal-framed pendants are full of potential. Looking at your big stash of little beads? Allow yourselyourself to be inspired! *Please be aware that these materials are made of biomatter; that is, they are made of something which was originally part of a living animal or plant. If you collect your materials from outdoors, make sure you know what is OK to take, and where it is legal to collect. Leave flowers and seedpods of threatene/endangered plants alone; rubber trees and cork trees are endangered: reuse/upcycle rubber and cork instead; make sure no one is still living in sea shells before picking them; songbird feathers and raptor (eagle, falcon, owl, etc.) are not legal to collect or posses, even if you found it on your own property; and while it is indeed possible to happen upon a shark tooth washed ashore or a claw from a bear who lived in the 18th century, please do not hunt animals just to get a hold of their teeth, claws, hides, feathers, antlers, horns, shells, pearls, wool, bones, etc. Look at what we’ve done (as a species) to rhinos; they will be yet another Albatross hanging from our neck. The Egret was nearly driven to extinction from overhunting for its graceful feathers, and in the 1960s, America almost caused the extinction of its own national symbol: the Bald Eagle. I specifically did not include ivory as a material because it is illegal everywhere in the world to buy, harvest, or transport it over national borders. **Please be aware these materials are often sourced from very dangerous mines in very poor communities in Africa and Asia, even sometimes through the (ab)use of child labor or indentured servitude, under extremely hazardous conditions. The value of such materials is high enough (and average standards of living are low enough) that, once found and harvested, the people of a community may literally kill each other over the material which can be sold (if not first stolen or collected by warlords) for a significant amount of money (hence the term, “blood diamond”). A disproportionately large portion of Earth’s precious stones and metals are located underground in Africa- unfortunately, this seems to be more of a trouble than an economic resource for the people living on the continent. ~Note: Among the many types of “depression glass” sorts of collectible antique items (i.e. Carnival glass punchbowl sets, Cobalt glass vases, Cranberry glass dinnerware, etc.) are Uranium glass, also sometimes known as Vaseline glass, beads. This type of glass, under normal indoor lighting, is a translucent yellowish green, not “cloudy” in color, but more along the lines of “slightly foggy” or “misty.” Note that it is a yellowish Green- Not greenish yellow. Before the weaponization of Uranium and prior to basic knowledge of the effects of highly unstable materials (very radioactive, that is), it was used in all sorts of glassware, including jewelry and serving ware. While Cobalt and Cranberry glass are appealing for their beautiful, deep colors, and Carnival glass has a marvelous iridescence, the cool thing about Uranium glass is that it, well, fluoresces (it glows if exposed to UV radiation, such as that which is part of sunlight). Like glow-in-the-dark radium-painted military watches, Uranium glass is also a bit too awesome to be entirely safe. Don’t worry, collectors- while Uranium glass does emit measurable radiation, it has never been known to cause medical harm to anyone. However, it is strongly advised that Uranium glass never be used as dinnerware which directly contacts food, as buttons on clothing, or as jewelry- necklaces are the biggest No Way due to their proximity to the radiation-vulnerable thyroid gland when worn. Also, it is recommended that Uranium glass pieces be cleaned with a damp, disposable, paper towel, not placed in the dishwasher where other glassware is cleaned. If you’re suddenly paranoid because you own this unique type of antique glass and are afraid because it is inside your home, you can take the final, slightly-over-the-top precaution of not storing any Uranium glass in bedrooms or rooms where pets spend most of their time (such as where they sleep) and you’ll be fine. You’re already fine. Even if you’ve eaten off of Uranium glass, just don’t make it a habit, and you’re fine. If you have Uranium glass beads, you can incorporate them into your home décor instead of wearing them. You’re fine, your family is fine, your pets are fine, everybody is fine. OK.
Wallet/purse or party bag made of beads? Bracelets too. 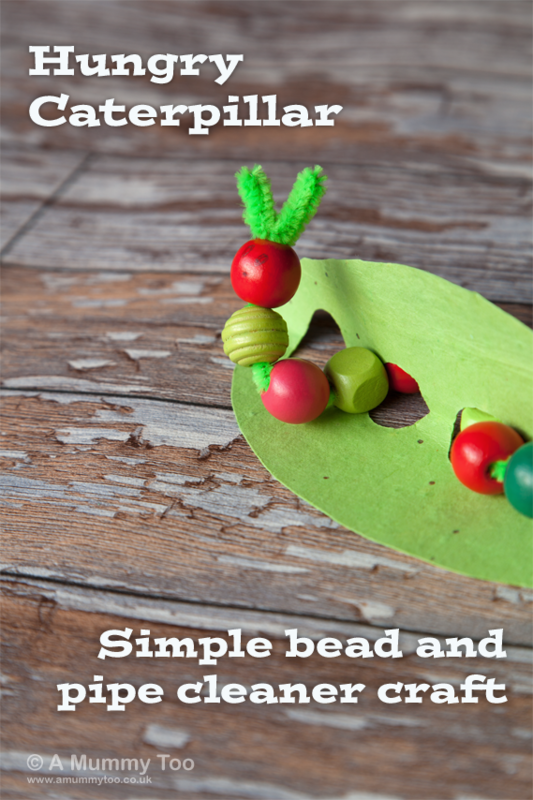 A great variety of ideas to use bead in several different ways. 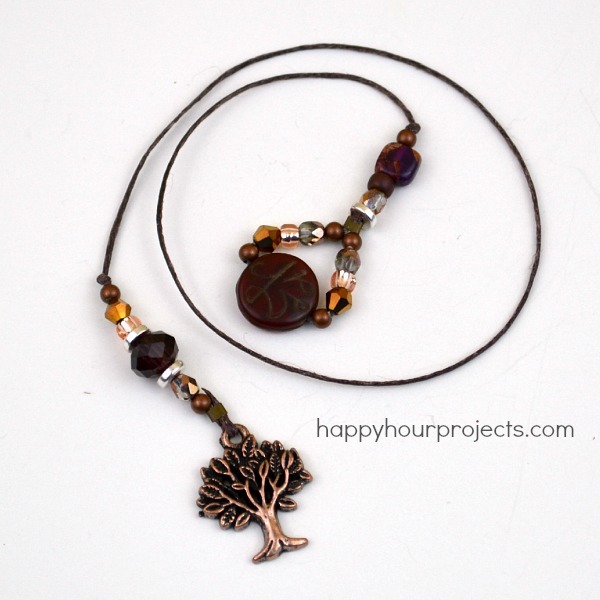 Love that these projects can use leftover, mix & match beads and materials. The tetris magnets are my favorite! Thank you for sharing such unique ideas.